Jim Bolger will have surprised a few people this week. In an interview with Guyon Espiner of National Radio, the former National Prime Minister expressed the view that “neo-liberal” economic policies have failed, and that an important aspect of that failure has been that most of such new wealth as has been created has gone to the richest people in society. The surprise was occasioned, as Guyon Espiner pointed out, because Jim Bolger had headed a government that had set about cutting taxes and therefore public services, and weakening trade unions – policies often seen as the hallmarks of neo-liberalism – and that is to say nothing of Ruth Richardson and her boast of delivering “the mother of all budgets”. I may have been less surprised than most. I did not return to New Zealand until 1994, and therefore did not directly experience the early years of the Bolger government. But, more importantly, I also had the pleasure of meeting up with Jim Bolger a few years back in a debate at Waikato University, of which he was then Chancellor and I had been Vice-Chancellor. I was pleasantly surprised to find how much common ground we had. I discovered a politician who had had time to reflect, and who had recognised the downsides of the changes in New Zealand society that had come about as a consequence of economic policies that had come to reflect the consensus across most of the democratic world. His declaration in this week’s radio interview, supported as it is by evidence from around the world, was intended, I believe, to apply as much to the global economy as to New Zealand. It is beyond dispute that the countries which have enjoyed the best economic outcomes have been those – like the Scandinavian countries – which have at the same time most stoutly resisted the growth of inequality. As for the rest, the application of neo-liberal policies has meant a poorer economic performance, accompanied by greater social division. We do not have to choose, in other words and as is so often asserted, between social justice and economic success. The former is an essential element in producing the latter and is not just a “luxury” we can do without. Or, to put it in another way, the failure of neo-liberal policies is largely attributable to their inevitable tendency to exacerbate inequality and to foster a lack of concern for the less fortunate. And a moment’s reflection will tell us why that is so. An economy will always be more successful if it engages with and uses all of its productive capacity – and that means its human resources – rather than leaving some of them under-used and undervalued. It is pleasing that Jim Bolger – a decent and humane man – should have come to realise the truth of these sentiments. The loss and damage we sustain, if we fail to take account of the interests of the whole of society, creates not only a weaker economy, but a more divided and unhappier society. Interestingly, Jim Bolger’s declaration suggests an unexpected contrast between himself and his eventual long-term successor, John Key. 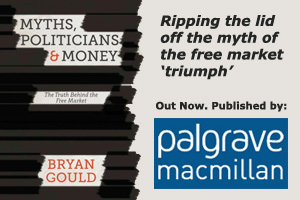 While Bolger allowed himself to appear driven by ideology, but was in reality more socially aware, Key was the reverse – apparently a pragmatist, but ideologically driven by the quintessential neo-liberal conviction that the market must always prevail. This in turn suggests that, in today’s politics, it is the right that is ideologically driven while it is the left that constantly seeks merely pragmatic solutions to pressing problems. The left’s difficulties in attracting majority public support suggest that solutions to problems will stand a better chance of being accepted if they are seen to be grounded in a coherent analysis of what has gone wrong. It may be that, in their anxiety to gain support from the “middle ground”, the left has too easily been frightened away from developing such an analysis. Surprisingly, they seem reluctant to engage in an ideological debate and prefer to leave the territory uncontested. If Jim Bolger can do it, and link outcomes to policy frameworks, why not the left? But, if there were to be a next time, Jim, could you please see the light and find the road to Damascus a little sooner? Hi Bryan, thanks for another excellent piece. I enjoy reading your work to gain a wee insight into NZ politics from here in the UK. Will you be penning anything on the UK election? It would be interesting to get your take on what you think the issues are and whether it’s at all possible for Labour to make up the polling chasm in time. Jim Bolger is the best ex-PM we’ve ever had. As an actual PM, he was shocking. He reminds me of the police chiefs who spend a career locking up young blacks for a joint or two, and come out for legalisation after retirement. When will we have someone in office with the cojones to take a position while they can actually do something?